The rules and regulations are so lax there that there is no government to step in and stop the atrocities. This horrific state of child slavery is also the perfect cheap labor for candy companies that want to sell you chocolate for dirt cheap prices. Why do you think it only cost $1 for a chocolate bar? After confirmation that the slavery was indeed happening and that it was as bad as the documentary depicted, US rep Elliot Engel quickly drafted US legislation commanding the FDA to introduce “slave free” labeling on chocolate, similar to organic labeling. The bill immediately gained approval in the House of Representatives and it was on its way to Senate where people were ready to draft it into law. It was then that the chocolate companies stepped in, promising to self regulate the issue, stating that there would be no more child slavery by 2005. It turned out, they didn’t do much. It’s 2015 and there are now more child slaves than there were in 2001 – 51% more, in fact. There are now 1.4 million children carrying backbreaking sacks of cacao, having their bodies within beaten and crushing themselves from dawn to dusk for no pay. 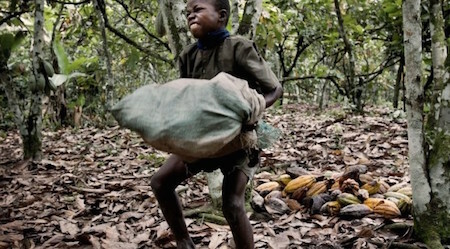 Now that it has become evident that Hershey, Nestlé and Mars have no way of handling the issue, California residents have filed a class-action lawsuit, requiring the companies to pay damages to people that have purchased the product “unwittingly” supporting child slave trade, and also that they print new labels that indicate the product was made with child slave labor.